This cozy, non-smoking, fully furnished, two bedroom cabin is nestled in the Rocky Mountains at the headwaters of the Blackfoot River near Lincoln, Montana. It can easily accommodate eight people with a queen bed, a double bed, and bunk beds in the bedrooms, and a sofa sleeper in the living room. It has a fully furnished kitchen, a bathroom w/shower, a television, VCR, DVD player, and a small selection of videos. 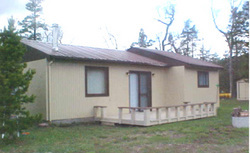 The cabin is equipped with a horseshoe pit, a deck w/sliding glass doors, a gas barbecue, and a fire pit. There is a park-like area that backs up to the Blackfoot River. You would be close to numerous trails for hiking, horseback riding, motorcycling, biking, fishing, four wheeling, snowmobiling, and cross country skiing. Airports in the area include: Helena, Great Falls, and Missoula, Montana. Directions: The Blackfoot River Cabin is eight miles east of Lincoln, 79 miles west of Great Falls and 80 miles east of Missoula on Highway 200. We are 48 miles from Helena on the Flesher Pass Road.